Congratulations to the 2015 National Tour Champions! View and order photos and order photos taken at the 2015 Tour Championship HERE! Jim Gallagher wins the Senior Amateur Golf Tour Championship for the second time in the past five years! Hilton Head, SC. (Nov 22) Jim Gallagher makes it four out five championship titles for the Southeast VA tour in the past five years. Gallagher started the roll back in 2011 and since then Ron Sullins and Bryan Layne followed. 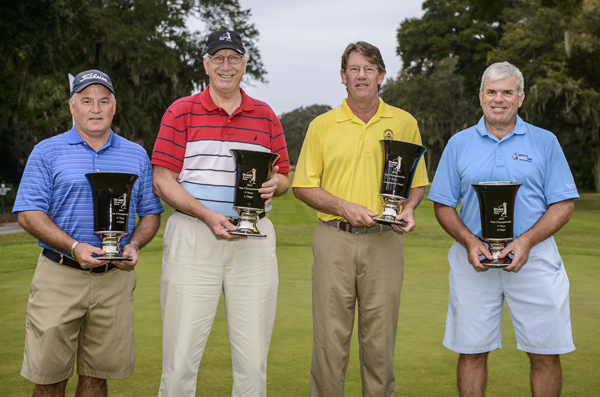 In the 2015 Senior Amateur Tour National Championship, Gallagher again hoisted the trophy for the Championship Flight. At the start of the second round, Gallagher was 2 shots back to Orlando’s John Ward who first a one under par first round of 71 at Hampton Hall. That lead was erased early as Gallagher got rolling with six birdies in his final round finishing with a four under par, 68. Cory Walker from Orlando tried to challenge Gallagher with 3 birdies of his own on the back nine, but fell short with a fine round of 71. Mike Dowless, also from Orlando finished third at 148 followed by Bob Wildner (NC FL) and Mark Hodges (Charlotte) at 149. In the A flight, Todd Soulliere (MI East) and John East (Central Carolina) tied after 36 holes at 155. Soulliere took home the A Flight Championship for Michigan in a one hole sudden-death playoff. Don Manuel (Birmingham, AL), Jim Alford (Central Carolina) and Don Dunivant (Orlando) all tied at 159. Brad Bettin of Orlando fired 84-80-164 to win the B Flight Championship by three shots. Lewis Herndon (Central Carolina) finished second at 167 and George Russell (Southeast VA) was third at 168. Charlotte took home fourth and fifth place with Sam Carpenter at 170 and Chet Brileya 171. The C Flight Champion went to Ray Schilling of Charlotte at 173 followed by Joe Lee (Charlotte) with 176. In the Team Cup, Orlando took home the cup with a stroke total of 1294 followed by Charlotte at 1307 and last year’s winner Central Carolina with 1316 strokes. Special thanks go out to Palmetto Dunes, the host resort and the staff at the Trent Jones and Arthur Hills courses. Also thanks to Hampton Hall, Bear Creek and Dolphin Head CC for hosting the 2015 Senior National Championship.